I have a friend, Jose, who fishes at Wilson Springs a lot with a short rod. I've been very curious about the Tenyru RZ39LL, a 3 foot 9 inch spinning rod. A good friend of mine loaned me his Tenyru RZ39LL. I'm going to have to return it soon. My first trip was by myself just to get a feel for the rod. 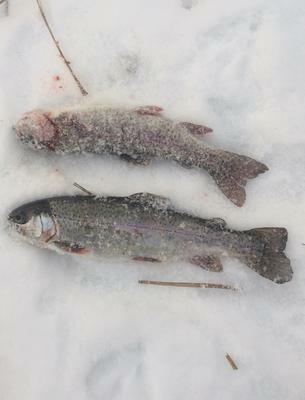 I caught several trout on spoons, and found that the short rod really does pack a nice punch. It is also very sensitive when fighting a fish. So, I called Jose and challenged him to a little comparison test. I had permission from the owner to let Jose try the Tenryu. We met a Wilson Springs last Saturday. 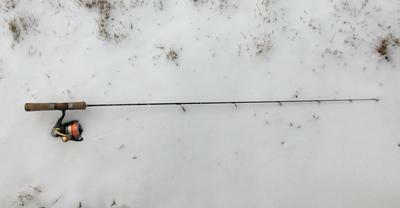 I had made up identical set-ups with 6.5x tippet material, two BB split shot, and Gamakatsu R10B size 14 hooks. I supplied the yellow mummy worms. I fished the Tenyru for a half hour and Jose fished his rod. We then swapped rods. I caught 4 trout in my half hour, Jose caught 1. After we switched, Jose caught 3 with the Tenyru, and I caught 1 with his rod. He was impressed with the Tenyru! I was depressed with his not so good rod! The fish I caught with the Tenyru put up a memorable battle. The fish caught on Jose's rod was simply yarded in. Afterwards we visited for about 20 minutes over coffee. I told him I caught fish over 90% of the time when I go to Wilson Springs. He told me that he was lucky if his success was 30%. He was baulking at the price of a premium outfit like the Tenyru and the Shimano Cardiff reel. I then asked him what it cost for him to come and fish at Wilson Springs figuring 50 cents a mile. He said, "About 10 bucks." I said, "In a year if you figure cost per fish, my outfit is less expensive than yours!" This week has been spent fishing the Forest Marshall Tournament .9 gram #6 spoon. (Picture #2). Since the Tenyru RZ39LL is rated for .1 gram, I figured I was close enough. I fished it 3 times this week and caught fish all 3 times. I was working in the shop and had to wait for finish to dry (Chris will have more of the Traditional Wooden Bait Boxes soon), so why not go fishing! Blizzard conditions kept everyone but me away from Wilson Springs! I fished the Forest Marshall Tournament spoon for a half hour and caught two 11 inch Rainbows (planters), and had one on that I lost. On Tuesday I stopped and fished the creek I cross on the way to work and caught two pike minnows (about 4 and 6 inches) in 15 minutes with this set-up. Thursday morning was a very successful day fishing the Tenyru in some tight places that I can't fish with my longer rod. The Forest spoons are very good spoons! Don't let this short rod fool you. It has way more power and sensitivity than I expected. If Chris doesn't sell out of them, there is one in my future. This is one awesome rod! Thus my name for it, "The Mighty Mite!" Oh, it fishes the 2.5 and 4 gram Crusader spoons very well too! 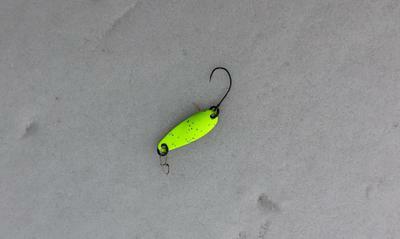 Love mine, it is all that I use on these alder choked streams I have to fish here. Anything longer makes casting difficult since overhead and bankside cover is crisscrossed with these alder branches. many times an underhand flip or sideways flip of 20-30 feet is all the open I can get. If I'm fishing a new stretch of stream one of my most important pieces of equipment is a folding saw to cut me a path on the next trip. Now if they would make this same rod with a baitcasting reel seat that would be awesome as I'm beginning to see the benefits of the BFS system.